Hutchinson was among the many printers offering a cheap series of 7d reprints. As was typically the case, a mediocre quality book with a bright jacket and list of authors that varied in quality. 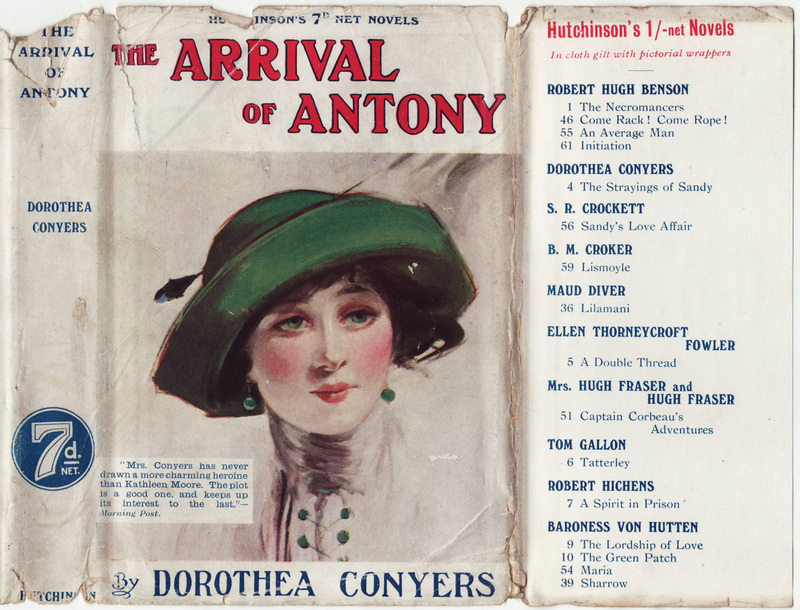 Hutchinson’s series appears in advertising around 1911 and not after 1915. Hutchinson acquired the firm of Hurst & Blackett, some sources say the 1920s but the firms were advertising their 7d series together as early as 1914. The jackets for the Hurst & Blackett series look similar to those for Hutchinson’s series, including the advertising for the Fry’s Cocoa (on the jackets and on the back of the book itself) suggesting the merger happened in the mid-teens. 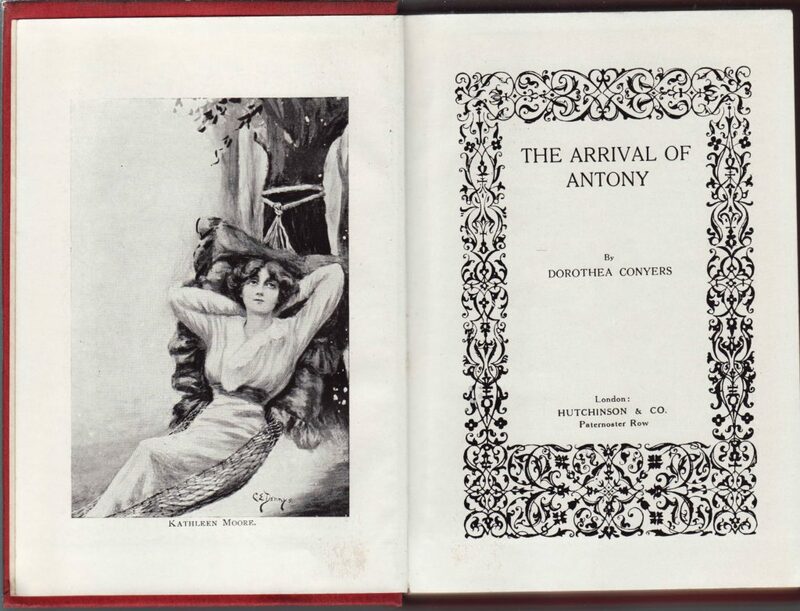 Dorothea Conyers’ The Arrival of Antony has no publication date, but probably about 1915 near the end of the series. Jackets include the price on the spine and the full series name at the top of the front of the jacket. A blurb about the book is cut into the unique illustration used on the jacket. 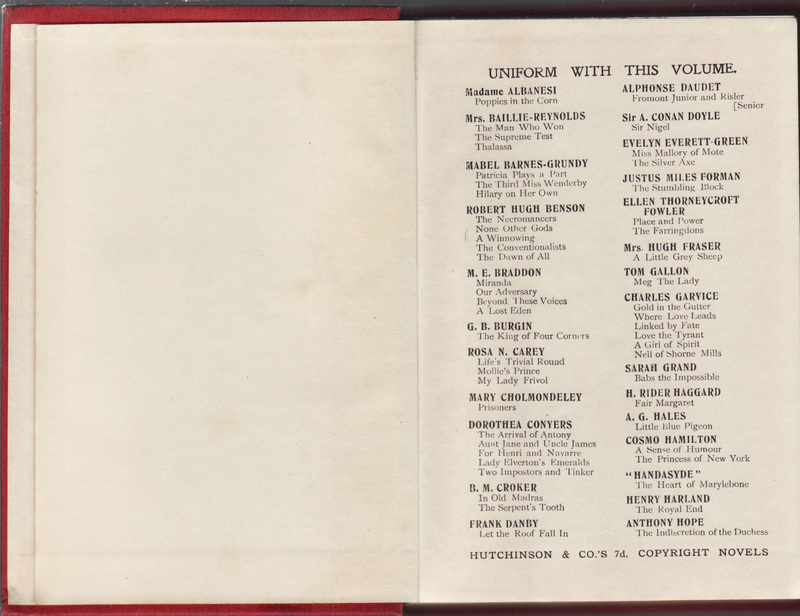 Advertising for Hutchinson’s 1/- net Novels takes up the front and rear flaps. A Fry’s Cocoa advertisement fills the rear of the jacket. 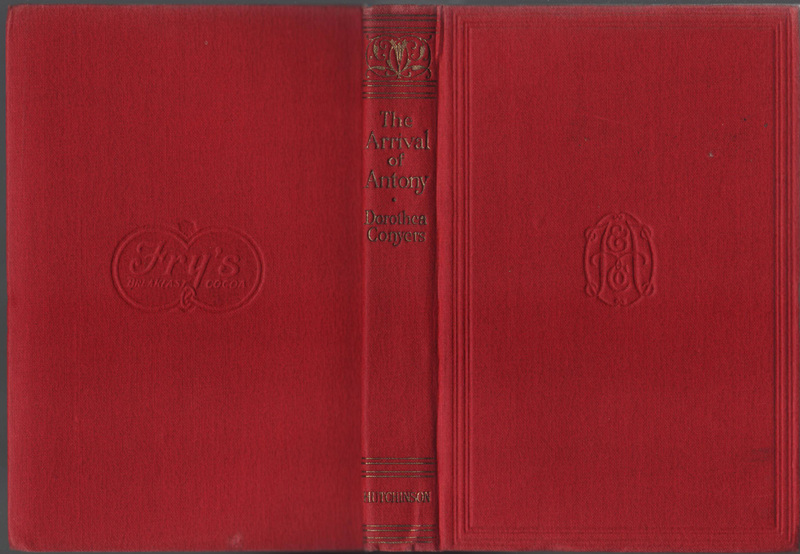 Bindings are relatively low in quality, bound in a red plasticised material with debossing and (now faded) gold decorations and typography. 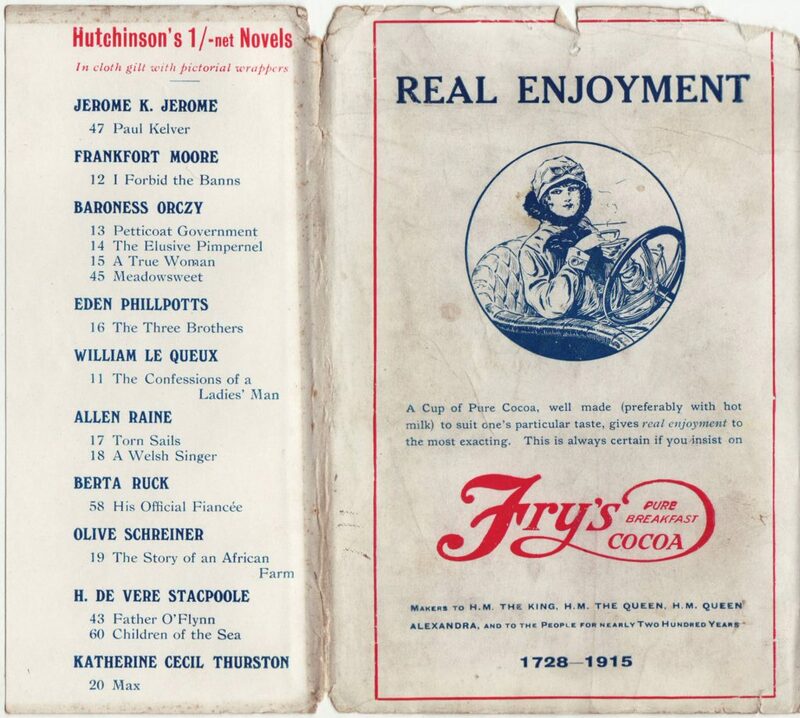 Like with the Hurst and Blackett 7d series, the advertisement for Fry’s Cocoa is on the back of the book itself. 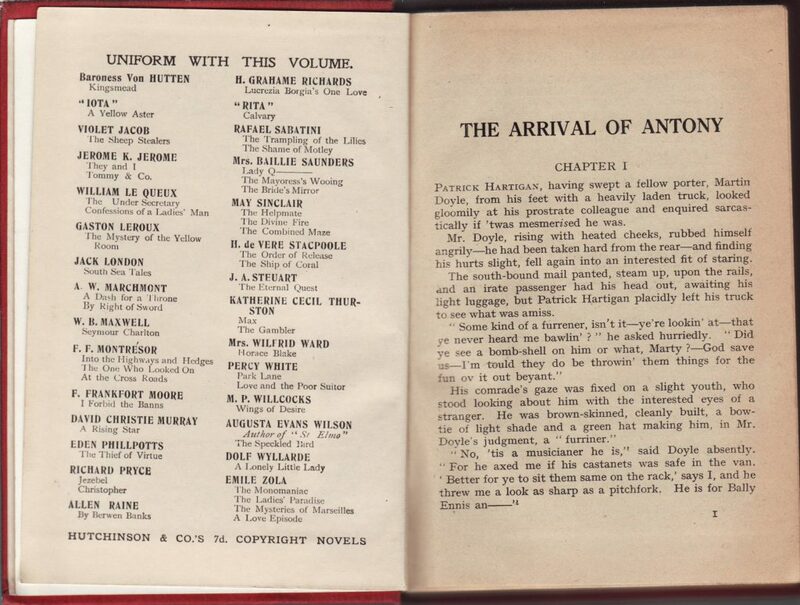 Other titles in the series are printed on what typically would be the half-title page. The series is called Hutchinson’s 7d Copyright Novels below this list. An illustration faces the decorated title page; both are printed on a higher quality paper. No date is indicated on the title page, and there is no copyright page following it. Where the copyright page should be is the continuation of the list of titles in the series. Series authors include Mary Braddon, Alphonse Daudet, Conan Doyle, Rider Haggard, Jerome K. Jerome, Jack London and Emile Zola.